To start, you need to inspect each and every part and component of your car. You should start with the air conditioning. This is because it is unlikely that you used it during the winter. If the AC is not working properly, driving around under the scorching sun can be a real bother. You should also check the oil levels and top up if necessary. You should also check the battery. Winter can be harsh for your car’s battery, because it needs to heat up properly to perform optimally. Make sure it is in good working order. Hot weather can cause your car to overheat. Just before the summer, you should refill the coolants and keep the radiator full. You should also check the rubbers, hoses and clips to make sure that water doesn’t water leak from the engine. As the summers are usually much dustier than the winters, check the air filters of your car regularly. If there is too much dust and dirt on the air filter, the engine might not be able to perform well. You should also make sure the tires are in good shape. After driving on snowy and slippery roads, the tires might encounter a lot of wear and tear. Check the air pressure daily and see if the tread is smooth or not. Don’t forget to make sure your spare tire is in good condition too! As you can see, you only need to follow a few basic tips to maintain your car for the summer. This is particularly important if you plan to go on a long road trip during the summer months. The last thing you want is your car to break down while you have to wait by the side of the road under the harsh rays of the sun. 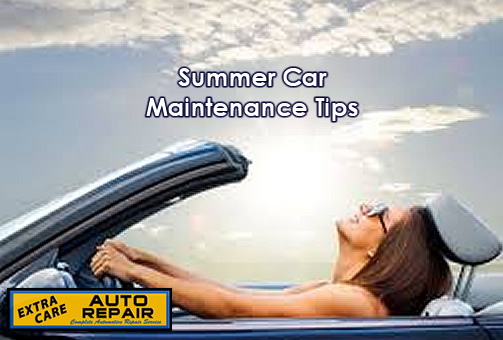 Do not ignore these summer car maintenance tips or you may end up with a poorly performing car.